Over the last year I have spent considerable time studying and thinking about food. 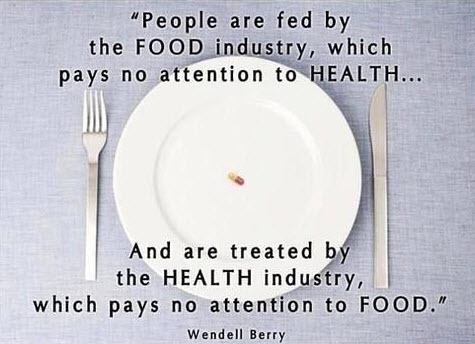 I have studied the connections between food and health, food and industry, food and the health industry and food and the government. It has been challenging on both an intellectual and an emotional level. I have been overwhelmed with facts and statistics. I have struggled to keep my temper in check. I have worked to be optimistic and not become too cynical. And most of all, I have tried to maintain a balance between evangelistic fervor and complete defeat. I never do anything by half measures! When this picture came across my screen, however, I had to post it. It may sound a little negative but from my point of view this quote says it all. I am not surprised because the author has become a personal hero. I first heard of him when I read Michael Pollan. I was intrigued and started researching the man and his works. Ultimately, I became a fan. My favorite book about food is a compilation of essays he wrote called Bringing It to The Table: on food and farming. There are people in this world that make you proud to be a human being. 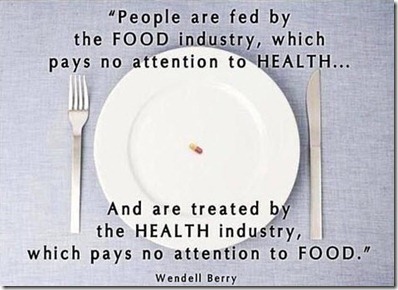 And Wendell Berry is one of them. Farmer, writer, environmentalist, dissenter and protester. A man who insists that he use his voice to make the world a better place. Whether or not you agree with him is pretty much beside the point. His passion, commitment and principled stands on what he believes in are just down right impressive! So now I have said my piece. And that is it for today. I know it is a very short post. My excuses are many. . .Holiday madness is upon us. Tomorrow may or may not be the end of the world. It is 20 degrees outside. But most of all I’m hungry. There really is only one problem that I can impact. So I am going to toddle out to the kitchen and put together a meal. When all else fails: eat! Genene Coté -- Nutrition Advocate, Counselor and Coach who is also a Whole Food Plant Based Eater (vegetarian/vegan), cook and gardener. This entry was posted in environment, GMO foods, Uncategorized, Wendell Barry and tagged author, Environment, Farming, Food and Health, Food Industry, Michael Pollan, Wendell Barry, Wendell Berry. Bookmark the permalink.